Sickle cell disease is an inherited disease that affects the red blood cells. Children with the disease have abnormal red blood cells that are stiff and half-moon-shaped, causing them to get stuck in the blood vessels, blocking blood flow. These blockages can cause crippling pain and organ damage, which require hospitalization. Red blood cells contain a substance called hemoglobin, which helps them carry oxygen from the lungs to other parts of the body. Patients with normal hemoglobin have mostly hemoglobin A in their red blood cells. 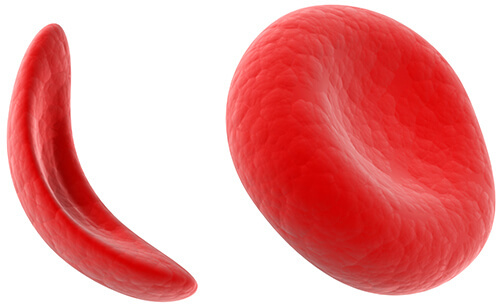 Those with sickle cell disease have mostly sickle or hemoglobin S (HbS) in their red blood cells. HbS is an abnormal type of hemoglobin that causes the red blood cells to change from a round shape to a sickle or half-moon shape and to become stiff and sticky. Sickle cell disease is an inherited blood disorder. Painful crises: Abnormal red blood cells block blood flow through the blood vessels, causing pain in the chest, abdomen, joints and bones. Pain can be more or less severe and last from a few hours to a few weeks. Severe painful crises may require that your child be hospitalized. Anemia: A shortage of red blood cells causes a lack of oxygen flow in the body, leading to fatigue. Acute chest syndrome (pneumonia): When a painful crisis affects the lungs, it is called “acute chest syndrome”. Symptoms include chest pain, fever and difficulty breathing. This condition requires immediate medical attention. Swelling of hands and feet: Painful swelling can result when blood flow to hands and feet is blocked by abnormal red blood cells. Frequent infections: Abnormal red blood cells can damage infection-fighting organs, leaving your child more vulnerable to infections. An infection can also trigger a painful crisis or acute chest syndrome. That’s why it’s important to consult a healthcare professional any time your child has a fever or any other sign or symptom of infection. Delayed growth: Because red blood cells provide the body with the oxygen and nutrients it needs to grow, a shortage of healthy red blood cells can slow your child’s growth and development. Vision problems: Abnormal red blood cells can block the vessels in your child’s eyes, causing vision problems. Symptoms of sickle cell disease should be treated as early as possible. In children with sickle cell disease, organ damage begins early in life and worsens over time but ultimately affects the brain, kidney, lung, spleen, bones, and eyes; which could lead to premature death.